With the remarkable Faraglioni in the background, the Marina Piccola bay is a beautiful beach spot that offers not just spectacular backdrops but also warm, inviting waters. 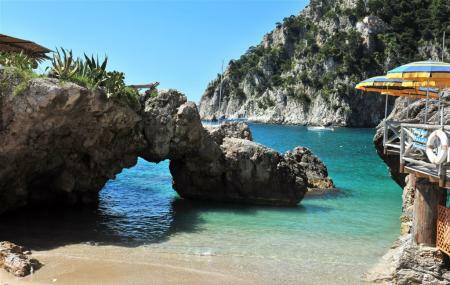 It is located on Capri’s southern coast and can be accessed by a flight of steps down from Via Mulo. On your way to this beach, you would also come across the tiny church of St. Andrea that was built in 1900. The Scoglio delle Sirene cliff is where Homer seduced Odyssey according to legend. These rocks spit the Marina Piccola bay into two marinas, the Marina di Mulo and the Marina di Pennauro, which were used by the ancient Romans as small ports. If you are planning on spending the day at Marina Piccola, we suggest you get there in the morning as the sun goes behind the hills and casts a shadow on the beach in the afternoon (around 5:00 pm in the summer). To get the most of the sun, you'll need to arrive early in the day: the sun leaves the bay at around 4:00 pm. How popular is Marina Piccola? People normally club together Anacapri and I Faraglioni while planning their visit to Marina Piccola.